This is my main guitar. It is an American Archtop Limited Edition 7 String Benedetto Tribute Model, Serial #002. It is Handmade by Dale Unger. It features a carved, supremely voiced top & back, solid German spruce top & solid highly flamed European maple back. 17" Body. All appointments are solid ebony. Kent Armstrong floating pickup. I met Dale at the 1996 A.I.S.A. (Association of Stringed Instrument Artisans) symposium. Jimmy Bruno talked me into switching to 7-String and showed me over to Dale's display table. 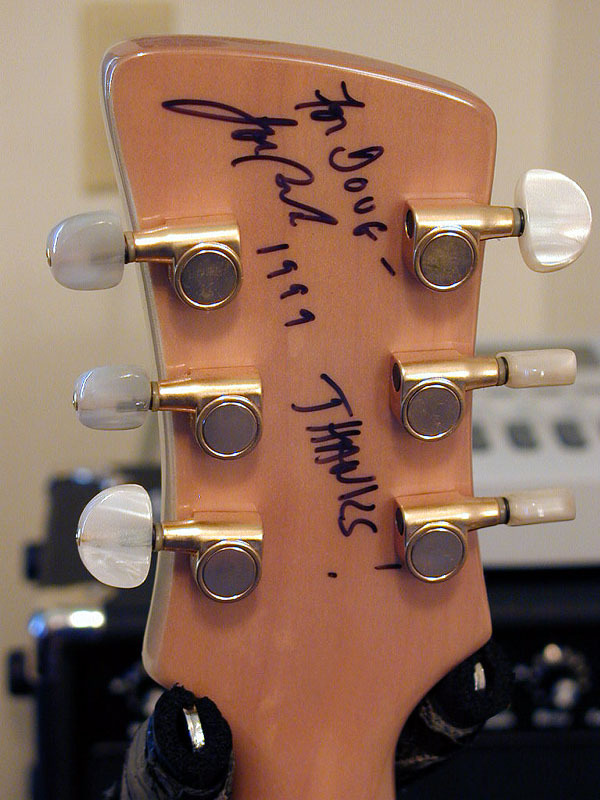 Three days later I ordered a guitar from Dale. I seemed to happen along at the right time. He was just introducing a limited edition model he called "The Benedetto Tribute Model". It features a carved German spruce top & carved European flamed maple back & sides. To my knowledge he only made ten of these. I've got Number 2 (seething with jealousy aren't you) As far as I'm concerned, Dale is destined to be one of his generation's great guitar makers. He's also a great guy with a sharp sense of humor & a great laugh. 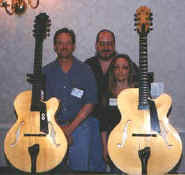 In my opinion, Dale Unger is by far the best archtop builder around today. 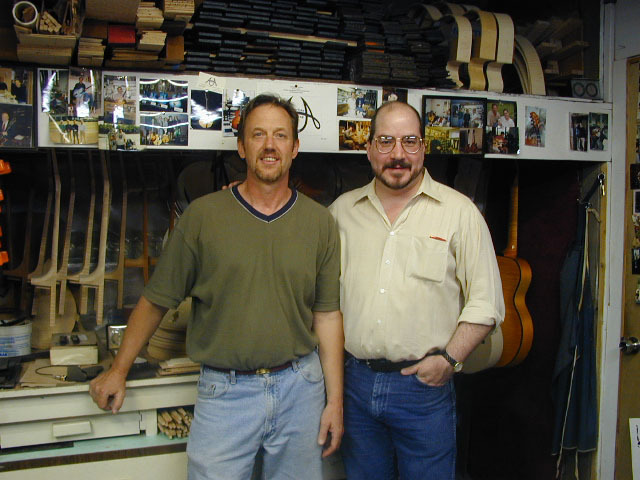 Here is a picture of Dale and I at a recent trip to his shop in Stroudsburg, PA.
as a "Thank You" for a favor I did for him. - Thanks Joe. to that of the second string on an electric bass. compare to the clarity of the Kent Armstrong pickup. transposition thing if you are playing it in an ensemble. between 6 and 7 string every time I needed to play an acoustic flat top. I found this to be a relatively inexpensive solution. The guitar has a great sound. It does have a bit of a chunky neck though. 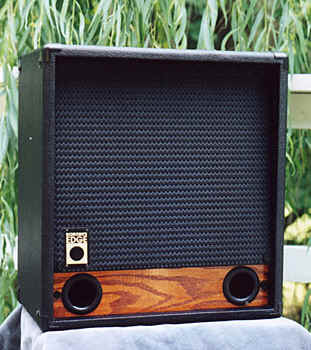 I used to use a Pearce G2r and loved the sound of that amp. Occasionally a gig would be too loud for that rig and things would get a bit "crunchy". 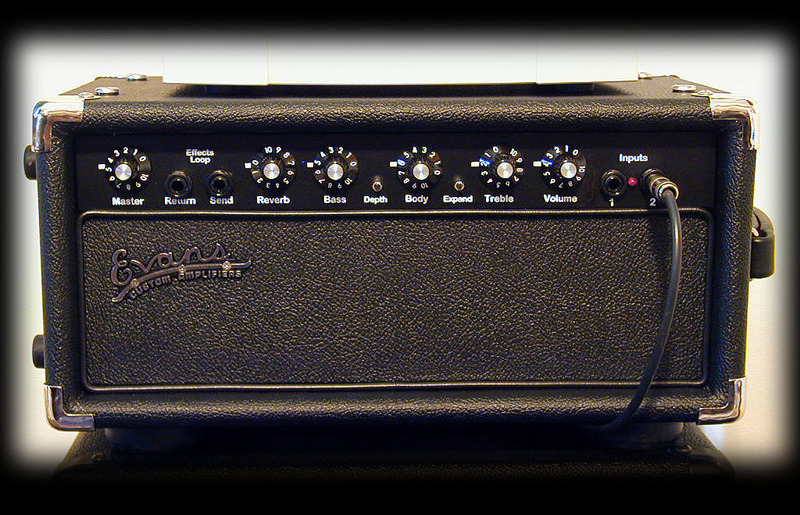 For a few years I have been searching for the right amp - I found it. and it is powerful enough for almost any gig I run into. a speaker cabinet before I bought a head to go with it. Rich Raezer makes incredible speaker cabinets. 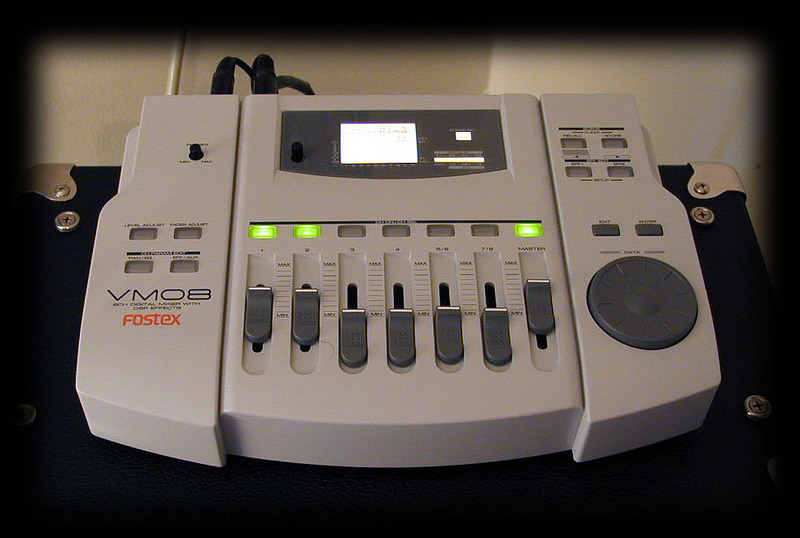 pickup even when playing mono so I could still process the treble strings separately from the bass strings. for all channels. It's portable, fits right on top of my Evans and sounds great.